I love how both Old Towne and Drew's place are almost completely leveled, but the bridge between them is completely untouched. Also, how there were still some undetonated TNT blocks left up in the Rink of Pain's roof. since it seems that's what is going to happen at this point. Maps are up with the new world. I still have the others saved and might move them to Lenny, but for now it has our new desert home. Pssst... I think you need to update the texture pack on the map-generating server. New blocks like mushrooms and stone bricks are invisible. edit: Or perhaps Tectonicus itself needs an update to map the new block IDs. That's the problem! Thanks. I was working to figure that one out. Edit: something changed with the new one because it's pulling from the right texture pack but still not showing the new stuff. I hope the developer for this comes back around. Last edited by turtle : 2011-09-18 at 15:04. With the new updates and new map, I have posted the final update to the 1.8 map. Look at the bottom of the 1.8 map to see Piggsburgh. Wasn't that a LOVELY location for a town? FAR better than Bruce's stinking sea village. One thing is clear: these worlds are going to be much bigger than they were before -- the biomes have a tendency of pushing people to explore their edges. We're approximately 2km from spawn in the new map already. I also fear that the aggressive pruning procedure might need to get modified to exclude all sorts of materials that are now generated in the map -- perhaps every normal world home needs a bit of netherack? Both of these "archive" maps are on Lenny. Please think of this when viewing them, it could take resources from the game, though not likely to be an issue. I just wanted to be sure everyone thought of that. Now, that being said, our main map is now running the Pre 1.9 map Lenny is running now. It's not live just yet, running it now though. Should be done before morning. Enjoy! Weird: The maps now display some but not all of the new blocks. For example: Stone Brick works, but gates don't. Netherblock doesnt work, but melons do. Very odd. Also, the secondary view is rotated 90 degrees from the main view - shouldn't it be 180? I cant see the front of my house on either view. I can change it to be 180. Good call! I'll make that change right after I finish posting on here for the night. Also, the new 1.9 blocks are not in the map generator yet. It's not going to be until after the 1.9 is actually released either it seems. Weren't gates from 1.8? Or did I dream that? Fence gates were in beta 1.8. The various nether brick materials are new to beta 1.9. Turns out there was a specific message that stated gates don't work right now because of how they operate. Fix is in the works though, as well as some other things we don't need to worry about. 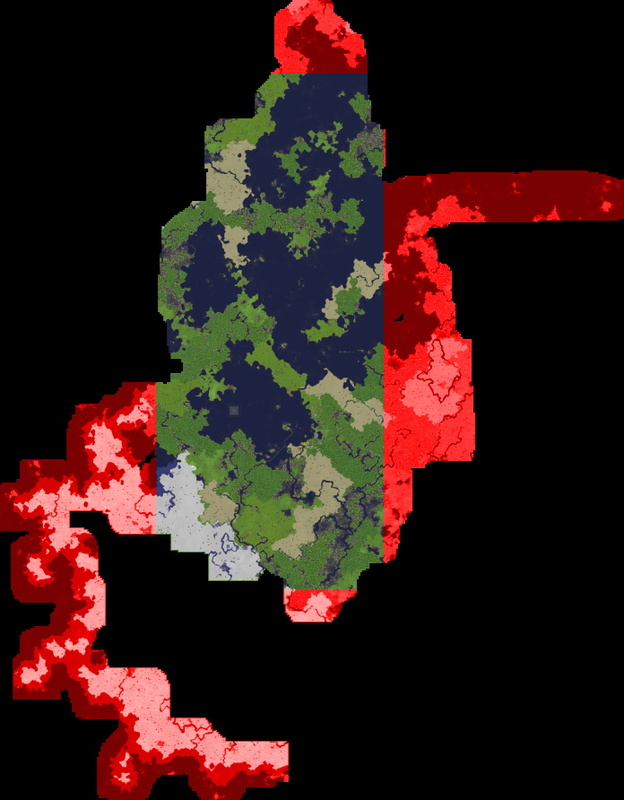 Seems the rapid expansion recently caused the map data to go to large and filled my server's drive to 100%. If you've not working with this before, it's not good. Thankfully I was able to SSH in and "rm -rf /" it all away. Ok, not really but I did SSH in an delete the maps and reconfigure the map generation to only be one direction again. 32GB for maps is a bit much. I think I suggested this before... can you cut out the closest zoom level? That should eliminate a good chunk of the disk usage (and bandwidth to push the updates). If you've not working with this before, it's not good. uptime = is it under heavy load? free -m = is all the RAM used up? df -h = is the disk full? touch /tmp/foo = is the filesystem writable? I did cut down the number of zooms, guess I can get one or too more close zooms. Have you seen the expansion? I was actually shocked at the "growth" of the world. Not that I mind, but wasn't expecting it. Yep, use those all the time now too. Not the touch, but I'll add that one. Have you seen the expansion? I was actually shocked at the "growth" of the world. Not that I mind, but wasn't expecting it. Holy crap. Not until now. Uh... and now that that prompted me to check, we're at 95% capacity on the RAM disk. Looks like I need to prune the branches. At work, I do a lot of work with VMs and network filesystem mounts. Checking if the filesystem is writable is much more useful in that kind of environment as opposed to having a physical disk attached, but it's a good sanity check anyway. This world was bound to get big given the fact that loch greene is so far from spawn. I'm about to shut down the server briefly to trim the world. The red area highlights what I'm cutting out (113 MB). Guess I'll see about doing a new smaller map too. After work today though. The snow biome mess is my exploration. I figured that since this world was toast soon I would try and see how big and what types of terrain would be generated in these environments. Better than abusing the new world after all. My bad I guess. BTW you may have to trim a little bit to the south again as I did have to walk out after all. Last edited by Elysium : 2011-11-12 at 17:48. We could just kill your player data and make you start at spawn. That snow biome is/was Huge! I hope we find an equally large one in the New World. Also, I've got our new map loaded and ready. Not sure if we have to wait for Tectonicus to be fixed or if it's easier than this, but: Since Notch changed NSEW, the indicator on the map has West labelled as North (and so on). It's something we are going to have to wait on. I'll post a message about it in the forum on that and see what we end up with.